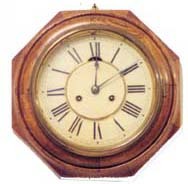 Ansonia Clock Co., "Eight Day Octagon Lever", ca 1904. Beautiful11 inch oak case, 8 day, double spring, time only movement, serviced and running. Full label on the back has been well preserved. Everything is clean and polished, only one fault with this clock. The metal inner dial has been replaced with cardboard which covers up the seconds hand, otherwise the clock is near perfect. I would assume they couldn\'t find a correct dial with a seconds dial. Ly-Ansonia No.702.